When buying a gift for "A Christmas Story" fans, of course there is plenty of merchandise to choose from. But here are the BEST 5 gifts that are unique - and they aren't t shirts! There are three types of people in this world. Those who like the movie "A Christmas Story," those that don't like it (what is WRONG with you people??) and then those who are infatuated with it - watching it not only at the holidays, but any time of the year. If you are one of those who can't get enough of Ralphie, leg lamps, pink bunny costumes and Red Ryders, or if you are gift shopping for someone who fits this description, then sit back and enjoy the ride! 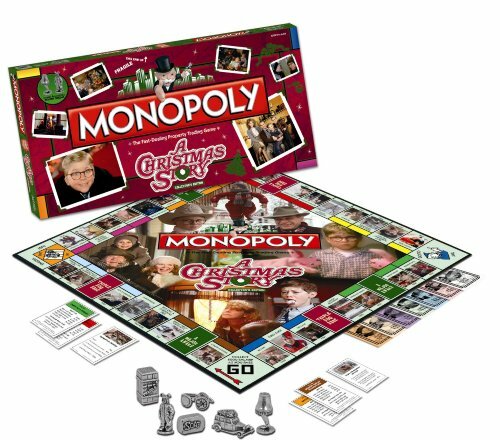 These are my Top 5 Unique gift ideas for A Christmas Story fans...hope you enjoy! Also...there are some little extras at the end, so be sure to check them out! Yes, Christmas Story 2 Is Available For Pre-order! Coming Out October 2012! Yes it's true - they have finally made A Christmas Story 2 movie! It is available for pre-order and is being released in October 2012. Because it hasn't been released, it is my number one choice because...well...it isn't out yet! That qualifies for unique, doesn't it? Personally, I can't wait to see it. However, you know how sequels go...hard to imagine anything will ever be as good as the original (how could it be?). But just giving us another taste of this fantastic movie should stifle any criticism. The Ralphie Pink Bunny Costume Is The Best! No one can forget the scene where Ralphie had to endure wearing the dreadful pink bunny pajamas. His stance was one of defeat, and haven't we all been there? I remember getting Christmas presents that, to be polite, my mom made me "model" for relatives and grandparents. Now what kid wants to do that on Christmas? One of my favorite stories wasn't a Christmas gift - but it was visiting an elderly relative in Colorado, who LOVED to crochet. We had endured crocheted everything for years. But one year, just before I was a teen, she crocheted me a pull over vest. Yes, in yarn, in vibrant colors. If I sat on her sofa, I would disappear, blending in with the one on the couch. What my mom and I laughed about is that it had holes...yep, see through. What was I to wear with this awful thing??!! 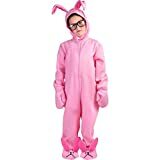 Ralphie Bunny Costume For Adults Or Kids Is Perfect! Can't You Picture A Christmas Story Bunny Pajamas On A Loved One? Classic movies always have a few scenes and images you just can't get out of your head - the leg lamp is one of them. As dad proudly displays his treasure in the living room window, for all of the neighbors to see, his family can do nothing but humor him. View the video to the right! A Christmas Story Leg Lamp Costume, String Lights Or Lamp Is Perfect! I like this gift for one simple reason - it allows the fan to enjoy his or her favorite movie all year long. Not everyone wants to watch the DVD over and over, including during summer - put pulling out a board game shouldn't result in to many "ughs." I haven't listed them all below, so keep in mind the following - there are action figures with sound that are 12 inches tall, plus ones without sound that are 7 inches. There are even some sets that include a bunch of figures in one. But these examples will get you started on your way! Below are some cute little extras that make great, unique gift ideas for A Christmas Story fans. The key for those obsessed with Ralphie, pink bunny pajamas, Red Ryders and leg lamps is that they can get any old tshirt anywhere...they want something different and unique! These little items below are perfect for thought gifts, too. They are fun and one of a kind versus traditional presents. Also, never forget a RED RYDER BB GUN could be the perfect gift as well. My husband shares his Red Ryder memories (absolutely similar to Ralphie's story) in in this article about Red Ryder BB Guns....so enjoy if you have the time! I like the part where Ralphie comes down in his rabbit pajamas.